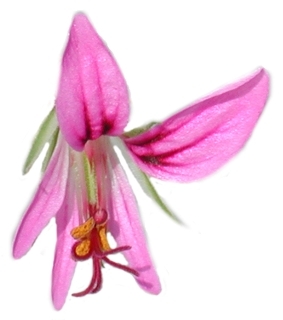 Sections of the Genus Pelargonium L.
The large number of species are conveniently divided into sections, which appear quite natural, since certain groups of species have evolved in a similar manner and posess similar characteristics. Recognising the section is often also useful in choosing the optimal horticultural conditions. Some of the associations are quite obvious and have not changed ever since the sections were united in a single genus by de Candolle in 1824. However, the debate among taxonomists continues and is mirrored in constant changes at the subgeneric level. Recently, the use of karyological, palynological and chemotaxonomic data has resulted in redefinitions of some sections, while macromorphologic characters were given less significance. In this website, the accepted species names are listed in bold italic type, with synonims in italic. For a complete and authoritative listing of latin binomials used for cultivars and hybrids, see Clifton, R. T. F. (1994). Linked names, if available, lead to species description, distribution and photos. NB. When searching through the list, note that some (nomenclatural) species' names were published by two or more authors not having in mind the same (botanical) species, e.g. tabulare (L.) auct. mult. non L'Herit. (sect. Cicconium) and tabulare (Burm.f.) L'Herit. (sect. Glaucophyllum ). The bar in the pictures denotes 1 cm (1 inch = 2.54 cm).